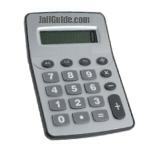 The Jail Guide Prison Sentence Calculator helps defendants calculate the amount of prison time they can reduce by their good behavior in state or federal prison. Prison Sentence Good Time Calculator, or, Earned Good Time Calculator basically operates on the theory that for an amount of good time that is earned it reduces the total amount of time in prison or jail. The prison sentence calculator is located further below on this page. Some have questioned why this calculator was made. We would like to offer that the calculator is used for people who strive to do better for themselves as well find out how much time off a prison sentence can be earned by doing good. This site is not only for the prison inmate, or soon to be prison inmate; this site is also intended for the victims of crime. Its for those people who wish to know how long an inmate will be in custody. We chat more about this topic in the "Who We Are" page. By inputting the information about your (or other inmate or person about to be incarcerated) state prison or federal prison sentence on the Jail Guide Prison Sentence Calculator you'll receive an automatic calculation of the "possible" good-time credit you could receive thus taking days, weeks, months or years off of your prison sentence. If you would like to find out how to calculate a federal prison sentence based on crime committed, visit our Federal Sentencing Guidelines page of federal information. If you would like to find out how to use our calculator freely on your website, please visit the Prison Sentence Calculator embed page. The video below instructs you how to use the calculator for a state prison or federal prison sentence.